WoT_RU_Doing, on 25 March 2019 - 04:06 PM, said: I have indeed read them, but I don't see my questions specifically answered in these sources. Let me explain further. So, starting from the announcement page, the only information I can see on what is required for each tier is this: For example, in order to create a Blueprint of a Tier IV vehicle, you will need 1 national and 4 universal Blueprints. 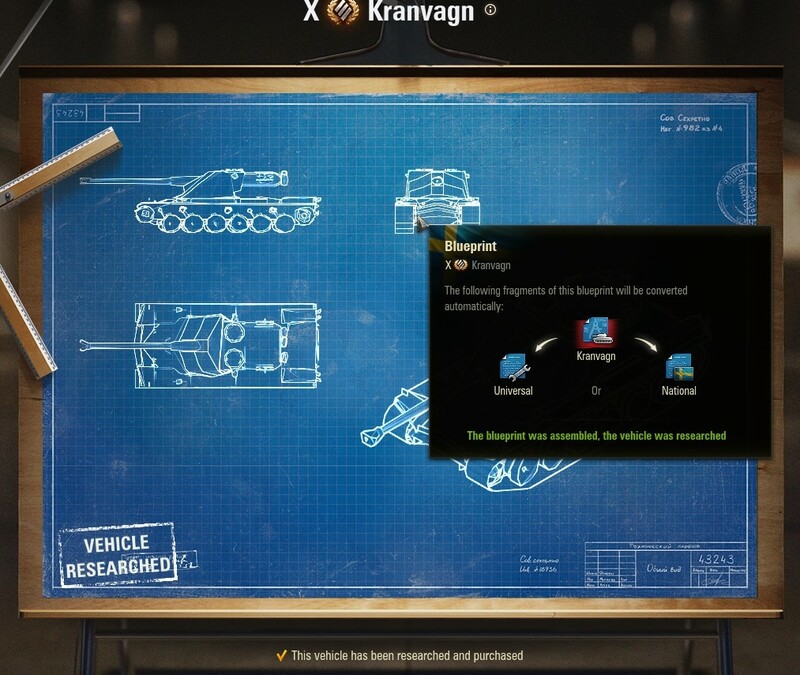 For Tier V vehicles, you will need 2 national and 6 universal Blueprints. For Tier X tanks, you will need 4 national and 12 universal Blueprints. I'm left to guess what happens at the other tiers. It does however tell me that I will need both national and universal blueprints to get a discount when the Swedish mediums arrive. In the combat intelligence section, all I see is this, which doesn't help me understand how/whether I can get national blueprints when I already every module/tank in the game researched. As it is, I have 14 universal blueprints, but is it just bad luck and I'll get national ones as time goes on? The single line in the announcement (already quoted by Qartan above) doesn't make this clear, as it is specific to if you have the tank already researched, not the entire nation. Looking in the blueprints section, I also get no information on how many blueprints are required in each tier, as it simply tells me I've got the tank researched already when I hover over it. So, from what I see in the announcement as quoted above, along with the interactive diagram, I know that to get a fragment for a Swedish tier 8 medium tank, I will be needing somewhere between 2 and 4 national blueprints, and 6-12 universal ones. 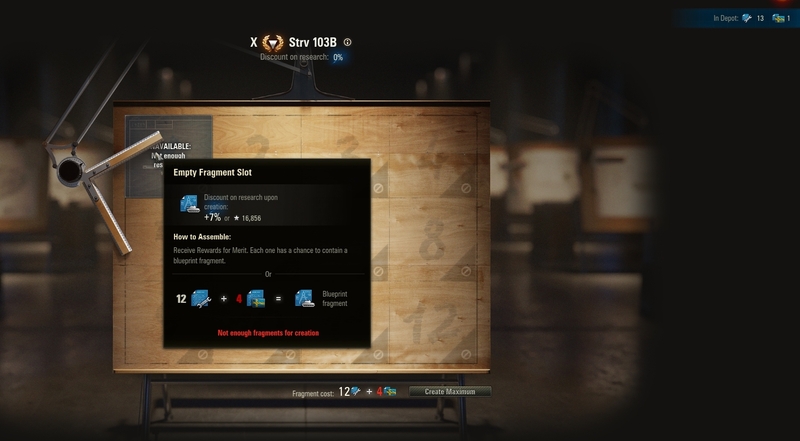 However, I don't even know if a tier 8 tank has 4 blueprint fragments, or more? The second Combat Intel picture I posted above suggests some tanks need 9 fragments? Finally, if I can't earn national ones, how do I get them? It seems bizarre that people who have not researched all tanks can save up their national ones and get a headstart on a new line, but I will have to wait to earn some national ones when the line appears, or not get the discount. I hope that helps clarify what I do know, and what I don't, as well as why I'm confused. P.S. I know I'm raising these questions from the point of view of the Swedish mediums, but that's more as an example...the questions apply regardless of which nation gets the next new tank in it's tech tree. eekeeboo: Thank-you for the response, that means I can now look on answering So you receive national blueprints, if you have all of the vehicles in that nation researched it will automatically exchange into a Universal Blueprint. So if you go to the Depot and then to the blueprints section you will be presented with this screen: If you go to an individual vehicle (I know you've seen this already, but shows you the breakdown): So from this, you are able to break down the blueprint resources you have available. The way you earn them: You get them randomly, mostly you will receive national blueprints and they will convert to universal when you're full on that nation. I have received a universal on its own (so far). In the second picture, you can see the requirement for each fragment and each fragment contributes that percentage highlighted. You should be able to earn national ones again once you have a line not researched. I understand that the system doesn't seem perfect, but it's also important to highlight that this helps so that people who don't have many tanks unlocked will be able to generate a lot of blueprints for those nations which will be in high demand while slowly unlocking universal, those with a lot of tanks unlocked will gather a lot more universal. This acts as a way to slow down progression and not make it so that players can speed through a line by farming blueprints. Hopefully this clears things up a little and you can use the info to help others too! Cheers, eek.